Gau-NA hosted the Bayerischer Löwe on Saturday, June 2, 2018, in Haldenwang in the Allgäu. Trachtenverein D'Wageggler Börwang helped us with the event coordination. Included on the same weekend was a Heufest, sightseeing, Fronleichnam (Corpus Christi) church service, meetings, Gauheimatabend, and the Allgäuer Gauverband Gaufest. Below are some of the info posts that led up to the weekend that 260 Trachtler/innen from Gau-NA attended. Direct link to D'Wageggler's Gautrachtenfest page. What is the Bayerischer Löwe? The first and second place winners of Gruppenpreisplatteln and first three place winners in each age category of Einzelpreisplatteln are eligible to attend the Bayerischer Löwe competition in Bayern the year after their win at the Gaufest. For advice on what takes place at the Löwe, click on the guidelines link. 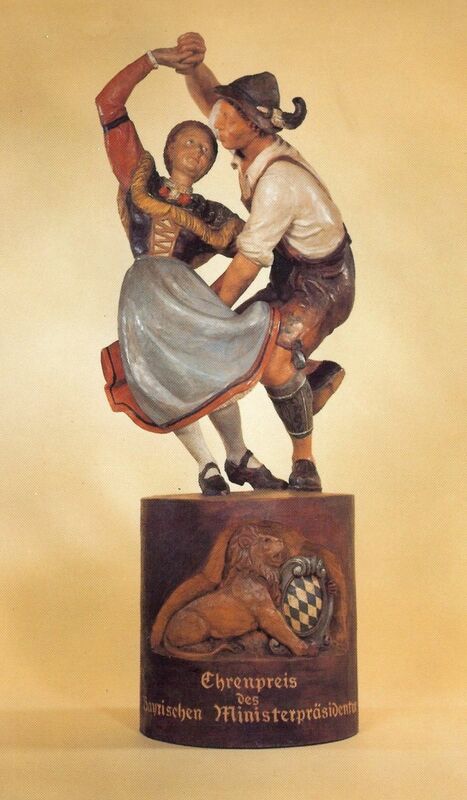 To learn more about the Bayerische Löwe in general, click on the link to the website below. The Guidelines have been updated as of 1/18/2018 to reflect improvements to the English versions of the scoresheets. Gau-NA judges may choose to use either the English or German version of the scoresheet. Gruppenpreisplatteln and Einzelpreisplatteln are two of the highlights of the biennial Gaufest, held in every "odd" year. For Gruppenpreisplatteln, each Verein (club) within the Gauverband may enter the Schuhplattler competition with one group of four to six couples. One of three dances is performed; which one and the order of performance are determined by pulling a number out of a hat the day before the competition. On Saturday morning, the nervous and excited groups assemble to have a 10-minute practice session, get pictures taken, then wait their turn to perform before the seven judges. The dance is either "Haushamer," "Haitauer," or "Reit im Winkl." For Einzelpreisplatteln, one couple at a time dances in front of the judges. 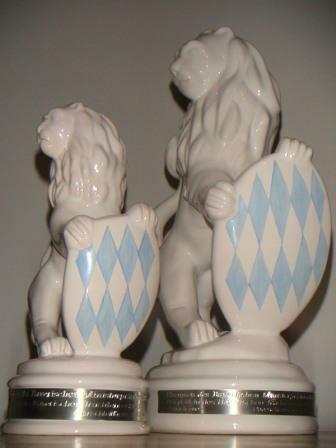 A couple may be from the same Verein or different Vereine and there is no limit to the number of individuals that can compete from any Verein. Einzelpreisplatteln is typically held on Friday, and as many as 80 couples participate from ages 13 up in five age groups. Beginning in 2019, the couple dances together but each is judged as an individual. The ladies are ranked against other ladies in their age group; the men against the other men. What are the Gau-NA Preisplatteln Rules? The group is judged on timing, spacing, posture, how well the skirts bell when the ladies turn, whether the men's "hits" are sharp and well timed, Ländler timing, and Tracht. What Happens at Gau-NA Competition? The audience of up to several hundred people is quiet and everyone concentrates on the performance. It's a true test of nerves for dancers, judges, the lone musician, and audience members alike. The music ends, the group or couple exits the floor, and the tension is broken with audience applause and cheers; the dancers hug and even shed some tears of joy, frustration, and tension release. An average of twenty groups participate in Preisplatteln. Each group is on the dance floor only about three exhilarating minutes. By the time twenty groups enter, dance, and exit the floor; scoresheets are picked up and distributed; and a short break is taken, two or three hours have passed. Einzelplatteln takes more than three hours; age groups are divided between separate rooms to speed along the competition. Afterwards, the judges, two Vorplattler, and Vortaenzerin tabulate the results. The scores of all the judges are compared, the high and low scores are removed, the remaining five scores are added together, and the groups and couples are ranked from first place down. By the time of the gala banquet on Saturday evening, only a few people are "burdened" with knowing the results of the Preisplatteln, and they are sworn to secrecy. Einzelplatteln results are announced on Saturday night. For each age group, the individuals taking the first three places are awarded medals. Everyone must wait until early afternoon of Sunday's picnic when the first five places of Gruppenpreisplatteln are announced, from fifth up to first. After each is announced, the group performs its dance once more, receives its prizes, and returns to the congratulations of the others in their Verein. Every Preisplatteln participant, regardless of place, receives a metal participant's pin. To see the winners of Gruppen- and Einzelpreisplatteln, go to "Gaufeste" tab and then select the Gaufest year.